This event was kindly organized by the students of Supaero University. I would like to express my thanks to the organizers who took pains to ensure that my colleagues and I were well looked after throughout the event. Normally I aim to take many photos, but as Air France took so very, very, long to check me and my baggage in for the flight out I missed my chance to buy a replacement battery for my camera at the airport for this trip. So my camera was out of action for most of the event. I hope that my colleagues who also attended can send me copies of their photos, which can be added to this site. Me and my luggage. Imagine dragging this lot through the airport! What's in the box? Answer - the MK4 and MK5 ekranoplan models that were demonstrated during my presentation and on the canal behind the university. The demonstration was filmed by a French TV station, but I don't know which one because they never spoke to me! Herr Fischer explains some of the complexities of ground effect. ....under the eye of Herr Günther Jörg. Stéphan Aubin, in the background, was the key organizer of the event and was actually much more interested in this than he appears! Some russian technical explanation. 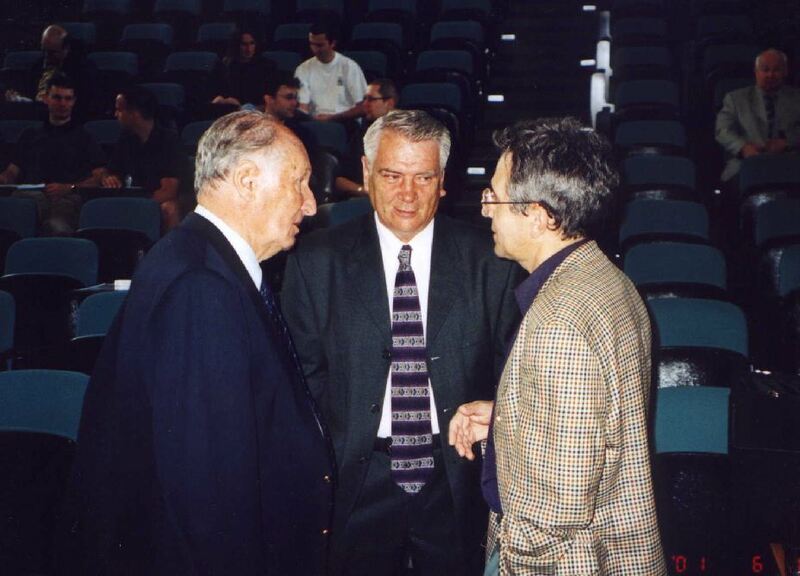 Dr Tomilin, left, Prof. Alexander Maskalik, right. ...and Prof. Kirill Rozhdestvensky acts as linguistic interpreter. My presentation "Practical guide to WIG Models" with some industry leaders in the audience. 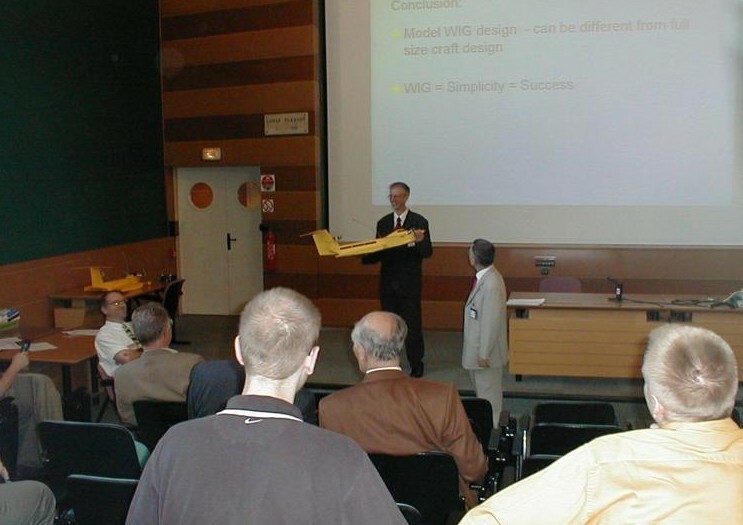 My MK5 ekranoplan model gives a little demonstration of PAR to conclude my presentation. The MK4 and MK5 ekranoplan models being prepared for launch. Kirill remarked that 'MK' is 'KM' backwards. The demonstration gathered quite a crowd. MK5 just skimming the water. The boats have to be 'tuned' so that they are stable in ground effect. 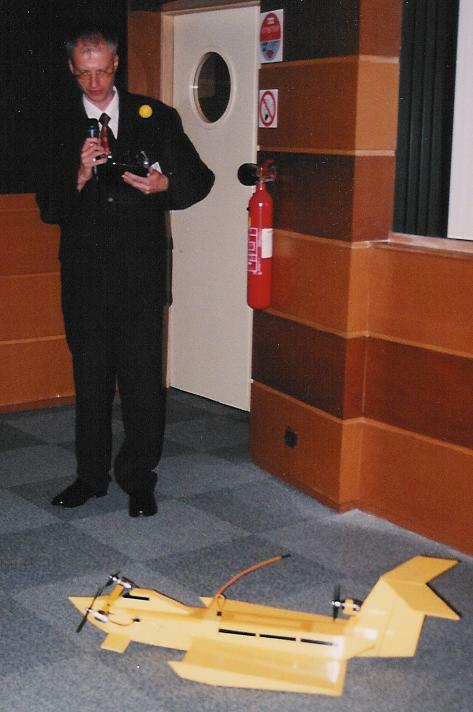 Herr Fischer and Dr Sinitsyn identified a problem with Dutch Roll and recommended rudder modifications. MK5 tries to reach 'ground effect'. 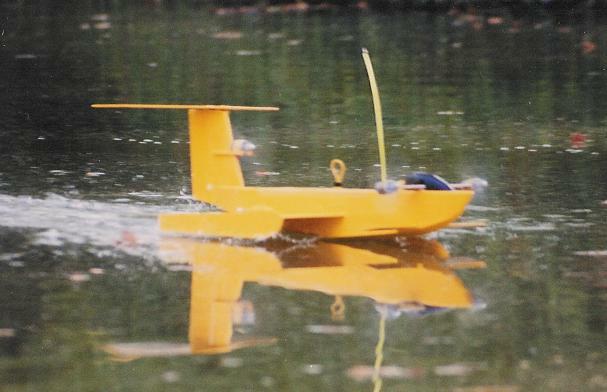 It was a little difficult to operate the craft in the narrow canal but two passes were made when the model achieved ground effect, and the wake behind it disappeared. The result of not quite the right balance between centre of gravity and stabilizer angle. Fortunately a volunteer from the rowing club was on hand so she was quickly recovered and returned to action.